A 1934 aerial of 'Matinecock Point', the J.P. Morgan Jr. estate designed by Christopher Grant LaFarge c. 1913 on East Island in Glen Cove. Click HERE for more on 'Matinecock Point'. Where once few lived in splendor now many live in comfort -- there, that's about as philosophical as I can get with only one cup of coffee in me. How beautiful it all once was---and how much more beautiful it must have been before the Morgans---just wild scrub and field and beaches. The estate planner was eco-friendly long before his time. 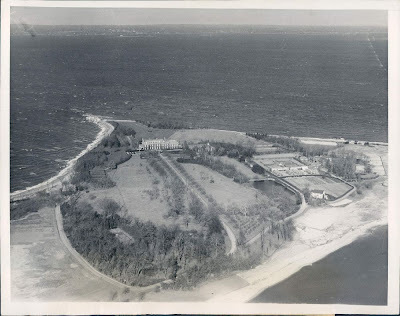 What the Morgans had left in its natural state; sand dunes, scrub and sea grasses both east of the service buildings and west of the boathouse/tennis court, is now entirely paved over with roads and houses. A beautiful aerial view of a beautiful estate. I look at that long, straight drive and I'm not thinking "eco-friendly" at all. I'm wondering how fast the car will go before I have to slow it down again. Unfortunately under the new changes at Blogger that feature has been eliminated. Ancient, what do you mean "slow it down again"? With an arrangement like 'Matinecock' you can hold the gas pedal to the floor as you're making the curve & then, just as you enter the courtyard hit the brakes & turn slightly to the left, sliding sideways across the pea gravel (great sound effect)right up to the first step; then you look over at your passenger & say, "There you go, Nana, safely home." This looks like a great place to check out. Is it open to the public currently? Only in memory. It was demolished over 30 years ago.